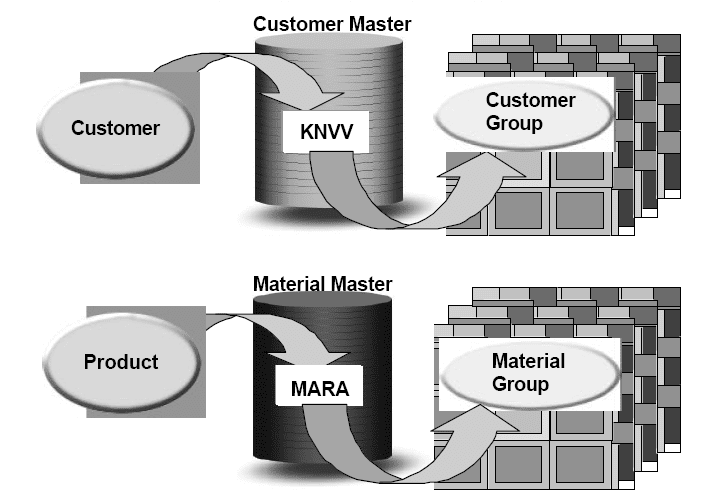 For reporting, sales organization, distribution channel, division, sold-to, ship-to, and product information is required from each order / invoice item.Product group and product hierarchy information is required from the material master record.Country and state are required from either the ship-to record (if there is one) or the sold-to record.Customer hierarchy information is required for each transaction involving a customer.Product groups are to be categorized into special categories called ‘strategic business units’ for reporting. Freight and packaging costs are to be estimated per line item on each order / invoice (transaction-based billing).Revenue and COGS are to be projected automatically for materials with planned quantities (in aggregate) .Detail Product Costing information is to be brought in per line item on each order / invoice (transaction based billing). Each COPA-relevant transaction in SAP (such as invoicing) triggers the creation of line items in COPA. 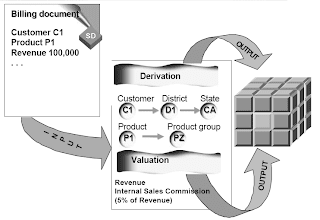 The data posted in CO-PA is determined through automatic and manual mappings, and through derivation and valuation configuration.For each SD transaction, the system automatically imports the sales org, distribution channel, division, customer, product, profit center, business area, and any SD partners for each sales order / invoice item. However, the values for all of these except customer and product can be overwritten with derivation.In addition to those values determined through the automatic mappings, derivation can access additional information (characteristic values) both on and off the originating transaction. 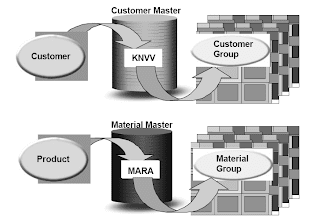 For example, it could supply the sales district from the invoice and the product group from the material master. In addition to those values imported through the manual mappings, valuation can import information which is off of the originating transaction as well. For example, it could supply detailed product cost breakdown information from Product Costing, which is not available on the sales document. n All COPA-relevant transactions are affected by derivation configuration, and some of these are affected potentially by valuation configuration (recall that configuring valuation is optional). 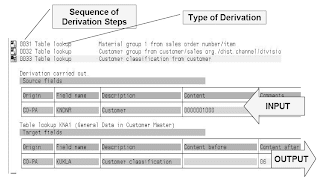 Characteristic derivation refers to the system's attempts to determine characteristic values for characteristics for all COPA-relevant transactions (supplementing the automatic mappings). 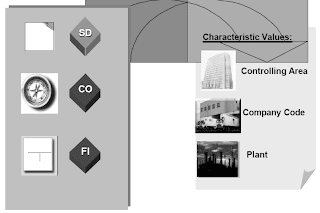 Supplementing those values determined through the automatic mappings, derivation can access additional information (characteristic values) both on and off the originating transaction.For every COPA-relevant transaction, the system will attempt to derive a characteristic value for each and every characteristic in the operating concern (if derivation configuration is complete).Derivation is not always successful. Unsuccessful derivation for a characteristic results in the posting of a blank, null, or unassigned characteristic value.The total combination of (segment-level) characteristic values for a given transaction comprises the definition of the relevant profitability segment, which is the account assignment object for CO-PA.
A derivation strategy consists of a number of different steps, which derive the different characteristic values.Each derivation step defines the logical interrelationship between known source characteristics and the characteristics to be derived.The system automatically creates a standard derivation strategy for each operating concern. This strategy contains derivation steps for all the dependencies that are already known between characteristics. You can then change this strategy to meet your organization's requirements.If you define your own characteristics that need to be derived from other characteristics, you need to define this derivation by adding your own derivation steps to the standard strategy. 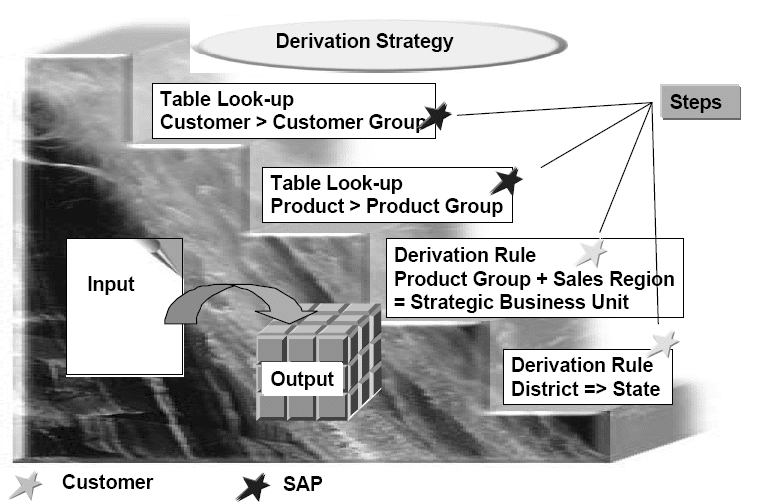 Each step normally refers to one of the customizable derivation techniques, which are: table lookups, derivation rules, region, product and customer hierarchies, moves, clears, and enhancements. The values for one or more characteristics can be determined in a single step. Derivation occurs for every COPA-relevant transaction, including direct entry into COPA and external data uploads into COPA. fixed derivation steps. 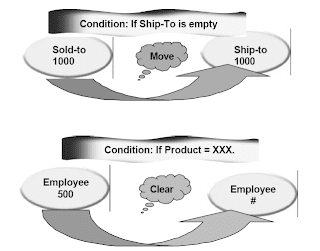 This is generally possible with all characteristics except for: controlling area, company code, product, and customer. These truly have fixed, non-modifiable derivation. n The system incorporates fixed derivation in order to force (at high levels), or at least enhance the possibility of (at other levels), reconciliation with data in other modules in R/3. 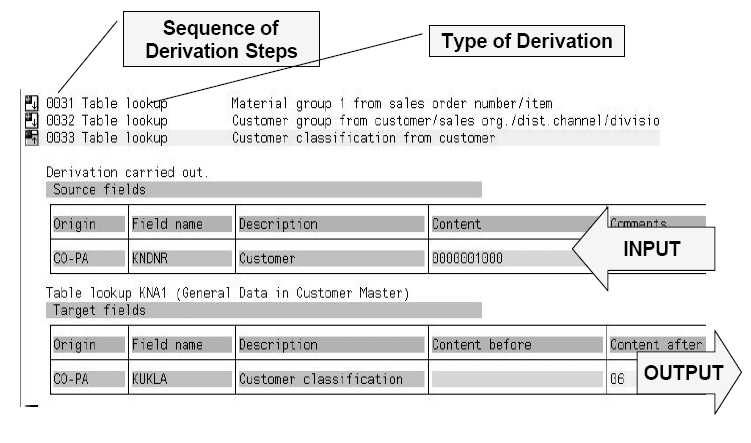 A table lookup is the derivation method utilized by CO-PA to access characteristic values from SAP master data tables (when this information is not available on the originating transaction, for example). n For example, an invoice may not contain the purchasing group for a material that is being sold.However, CO-PA can capture this information for the invoice item utilizing a table lookup. Table lookups are possible when the key of the table to be accessed can be filled will characteristic Values which are already known to CO-PA for the transaction.For example, a country value can be determined when a customer is known, since customer is the only key to the KNA1 table, which contains general customer information, like addresses.The ability to customize table lookup derivation allows the configurator to control exactly which types of characteristic values are used to access other characteristic values.For example, it is possible to configure the table lookup for the characteristic country to find the country value for the ship-to rather than the country value for the sold-to.Through table lookups, it is possible to access entire field values or even just parts of field values for The fields in those tables whose keys can be filled with known characteristic values for transactions.For example, the derivation lookup for product hierarchy could be configured to import the entire product hierarchy value, or maybe just the first several characters of the hierarchy, into CO-PA. Some table lookups are generated automatically (based on a characteristic‘s definition) when the operating concern environment is generated. The non-fixed lookups can be modified, however. Other tables lookups must be created from scratch. Derivation rules are used to determine characteristic values through user-defined logic. 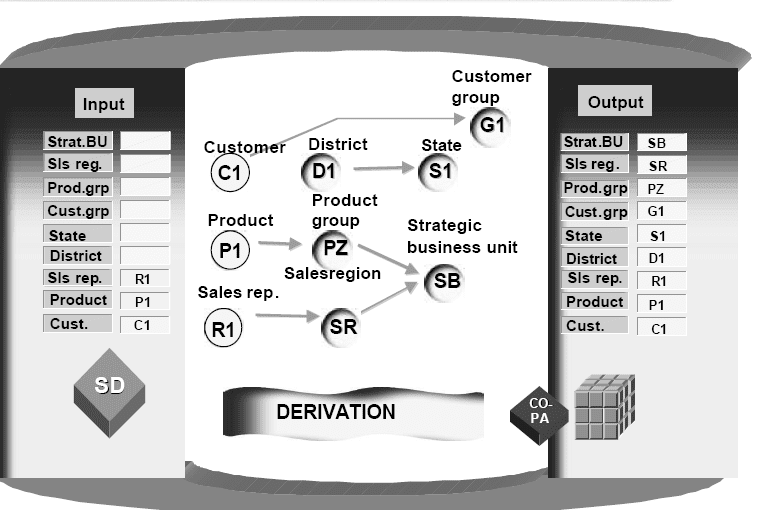 They are most frequently used with user-defined characteristics, though they are not limited to this application.With derivation rules, characteristic values (known as target values) are determined directly based on the values of other characteristic values (known as source values).Like other derivation steps, derivation rules can be configured either to apply for all situations, or to apply only when certain conditions are met (e.g. when a sales organization is 1000, for example). 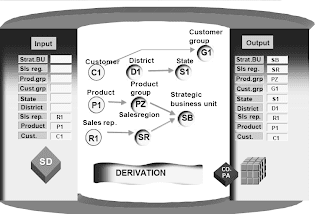 Also like other steps, derivation rules can be configured to produce an error when a value cannot be determined via the rule entries, or to ignore this failure and proceed.Unlike other derivation steps, derivation rule entries can be configured to either be related to a specific interval or time (time-dependent), or to be applicable for all time (time-independent).Derivation rules can be set up in sequence with other derivation steps and methods to produce complex derivation logic. 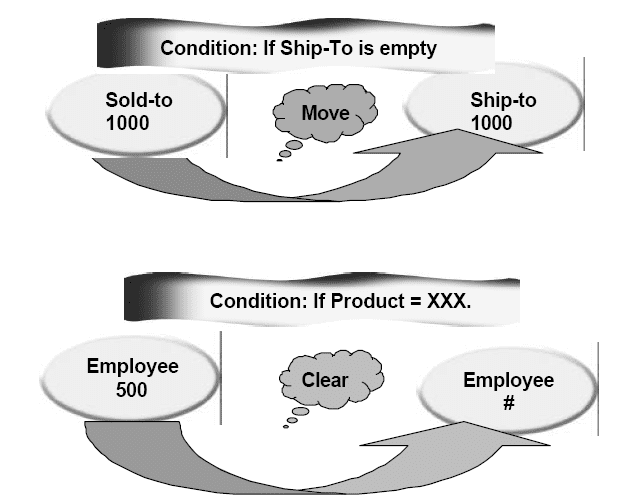 The move function is available to directly either move a value or part of a value from one characteristic to another, or to move a constant into a characteristic, when certain conditions arise.In the above example, the sold-to value is copied into the ship-to value with the move function if the ship-to field is originally not populated by any previous derivation step.The clear function is available to clear a value from a characteristic, when certain conditions arise.In the above example, the employee value is cleared to 'not assigned' when the product is a specific value, because perhaps employees should not get sales credit for certain items.The system automatically generates a move derivation step for moving the dummy profit center value from EC-PCA into CO-PA if no profit center can be determined by other steps.